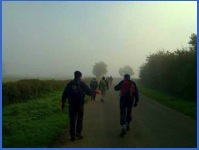 Although I have enjoyed the 20 mile plus challenge walks, I have, in recent years, found them increasingly hard going. I was, therefore, keen to have a go at the Waltham Winder, which, besides the 26 mile walk, also offers walks of both 10 and 16 miles in length for the aging and/or less fit. I will let brilwalks visitors decide which category I fall into. Another plus with the “Winder” is that it is also fairly level. Well, at least a lot flatter than some of the challenge walks I have undertaken in the Peak District. So it was decided; any fit “Boys” available on the 9th would tackle the Waltham Winder. Unfortunately, Mick had strained one of his ankles a few weeks earlier, and had been told to rest it and Ray was going to a children’s party! 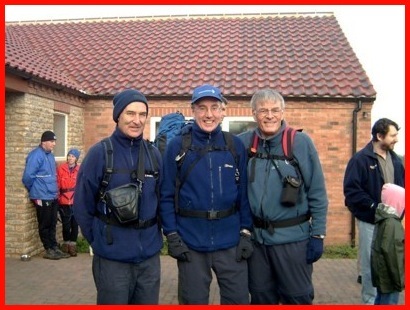 So,for what we hoped would be a good day’s walking, Larry and I met up with Peter soon after 8.15 a.m. in the field at Waltham on the Wolds that had been taken over as the car park for this event. It was cold. It was misty. 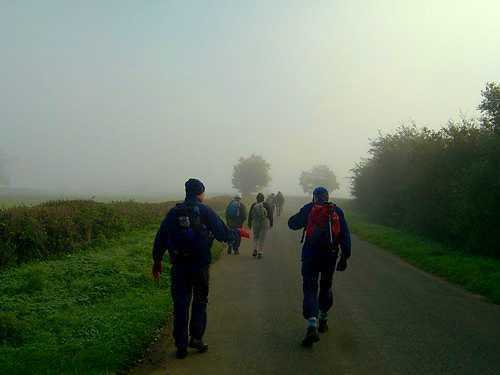 I think we all did a little shiver as we put on boots and sorted out our rucksacks before making our way to the Waltham Village Hall for the start of the 16 mile walk, which would commence at 8.45 a.m.
Time 8.44. Outside the Waltham Village Hall. Left to right Peter, Larry and Barry. 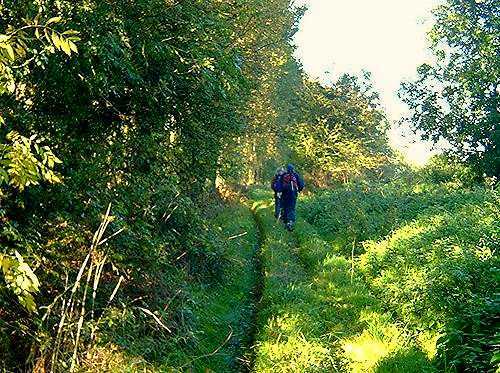 Photograph taken by another 16 mile walker. Having arrived at the Hall we just had time to check in, have a cup of tea before we were off. From the Village Hall we turned right and went eastwards over the A607 before turning left up a lane. This was very easy going and very pleasant with the sun doing it’s best to break through the cloud cover and burn away the mist that was covering the fields. Navigation was easy. All we had to do was follow the direction arrows and markers, which the organizers had placed at key locations. 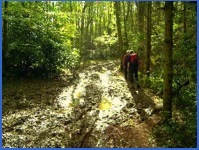 The organizers were obviously aware that very few walkers would have, or want to obtain, the three O.S. 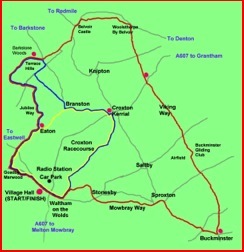 Maps, which would be required to cover the entire route. Don’t you just hate it when the area you are walking is right on the intersection of two or more maps! About a quarter of a mile along the lane we left the 26 mile route and soon after our route, along with the 10 mile one, went left and then we turned right onto a gallop close to Racecourse Farm. 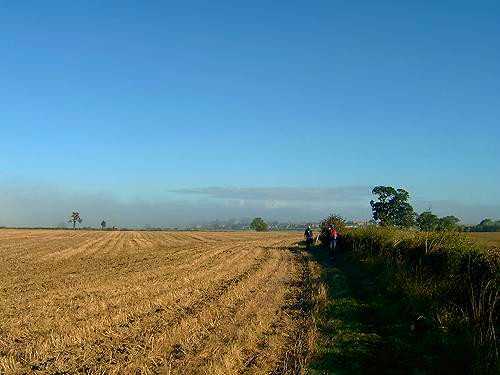 The going was not easy and the undulations, and the softness of the surface made it less than ideal for walkers, and I expect most, like me, were pleased when the gallop was left and we continued initially on a good quality track and then across fields to our first check point at Croxton Kerrial. The time was 9.55 a.m. when we arrived at the check point. It had only taken us 1 hour 10 minutes to cover the first part of the walk, a distance of about 4 miles. A very pleasing pace. One thing I did like about the walk was the food and drinks at the check points. These were excellent. Moreover, by now we certainly needed the drinks. 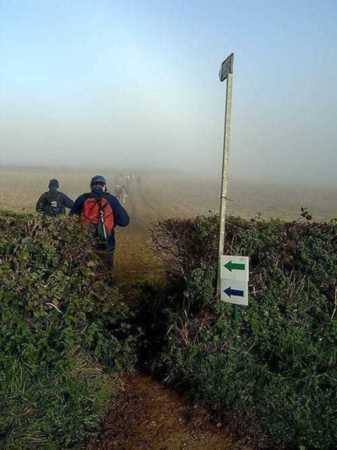 The sun had broken through the mist and cloud cover and we were getting warm so the three of us discarded our fleeces and felt much more able to continue our trek through this part of the Leicestershire countryside. 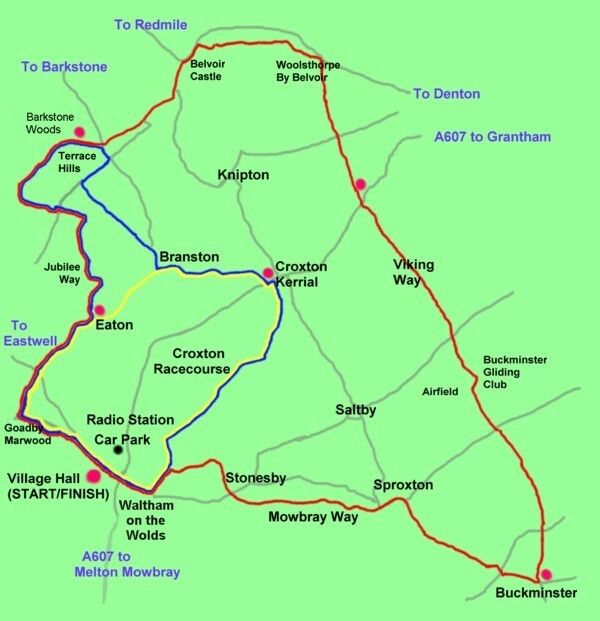 Our next stop was Branston, which is almost due west from Croxton Kerrial. 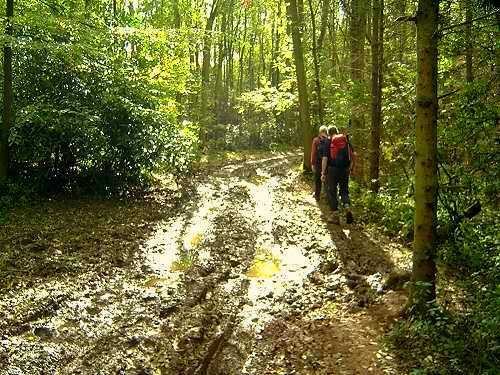 However, to get there we had to negotiate a really muddy track and like the earlier “gallop” we were pleased when this part of the walk was finished and we were able to follow the more solid surface of a lane. 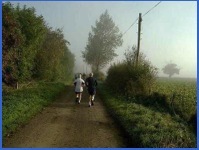 However, although the surface of the lane did deteriorate in parts it was considerably easier than Leicestershire mud. This part of the walk was also quite undulating and although the scenery was more interesting than the earlier part of the walk, the ups and downs were less friendly on the knees, but all of us managed this part of the walk, indeed the whole walk, without resorting to the use of walking poles. 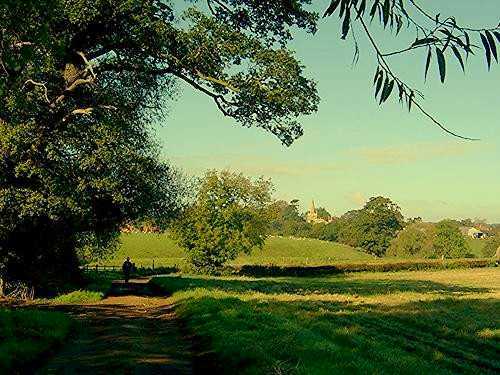 At Branston we said goodbye to the 10 mile route and walked northwards before, on the outskirts of the village, taking a path left and soon after a field track on the right. 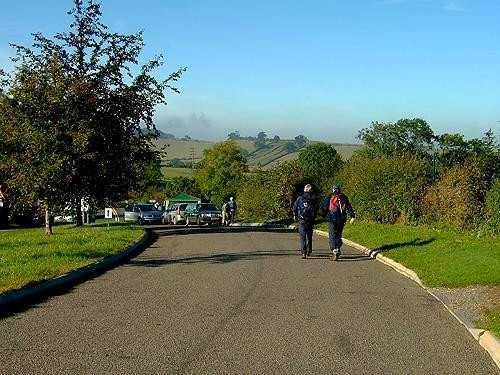 For the next mile or so we "enjoyed" some uphill work before joining a road near Terrace Hills Farm, which we walked past as we went north east towards Belvoir Castle. 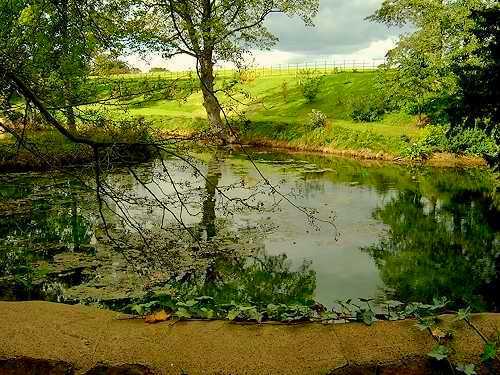 I imagine if we had raised our eyes, or not been so busy talking, we would have seen the Castle in the distance, but unfortunately by the time we thought about it we had turned left towards Terrace Hill and Barkstone Wood and were at our next check point. We were now halfway and it had only taken us 2 hours and 26 minutes. How can I be so sure? The time of arrival was logged on my digital camera when I took a photograph as we approached the check point. 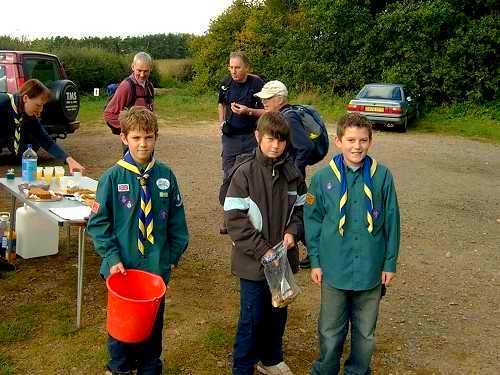 Yet again, there were refreshments, which were provided with the assistance of the local Cub Scout Troop under the watchful gaze of the supervising adults. Our route was now along lanes and metalled tracks until, just to the north of the final check point at Eaton, we crossed fields and followed some more muddy right of ways. At one point on this part of the walk it became very overcast and we all started to consider the need to don wet weather wear, which would have been uncomfortable as we were all, by now, very warm from our exercise. Therefore, we resisted the temptation and by the time, we reached the Eaton Check Point at 12.18 p.m. the greyness in the sky had almost vanished. At the check point, I was glad to have a good drink. 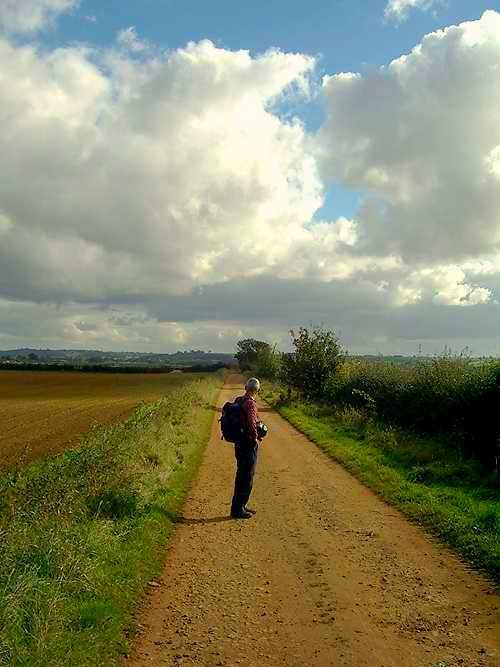 I was now also looking forward to the end of the walk, which, according to Larry, was about 4 ½ miles away. 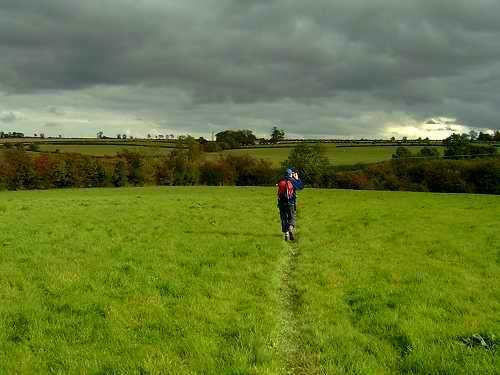 So we left the Eaton Check Point and were soon crossing more fields. 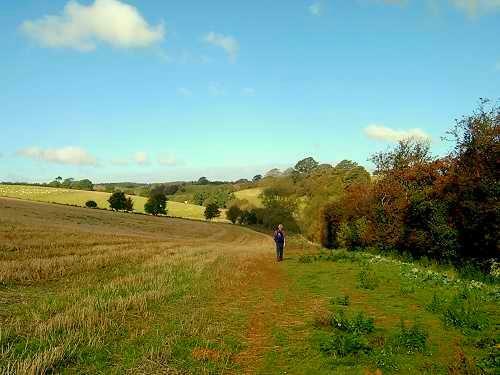 Although we had more or less followed the way we had expected to walk from Waltham to Eaton, this last part of the walk was a bit of a mystery to us and did not follow the route we had expected. 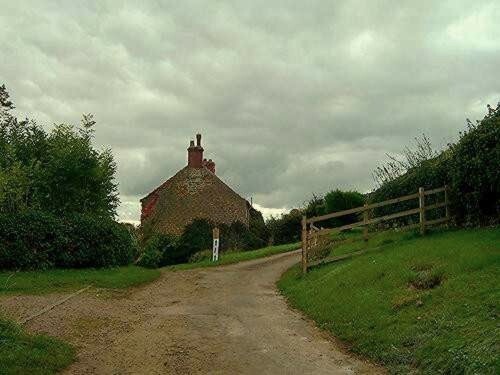 But navigation continued to be easy - we just followed the signs - and just over two miles later we found ourselves in Goadby Marwood, or should I say we realised we had been in Goadby Marwood as we looked over our shoulder at the village sign as we left this community. From here, except for short cuts over the fields, we followed the road back to Waltham arriving at the Village Hall at 1.39 p.m. 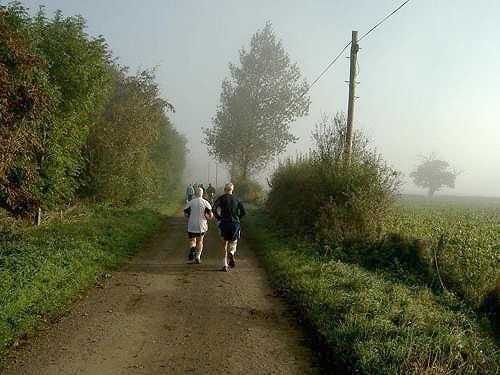 It had taken us 4 hours and 54 minutes to complete the 16 miles, which was a little bit quicker than the 5 ½ hours I had anticipated. We then enjoyed soup and rolls and, although there was other food available, Larry and Peter declined more nourishment. However, I could not resist the apple pie and custard, which was very enjoyable, before we moved on to a local public house for a glass of beer before starting home. 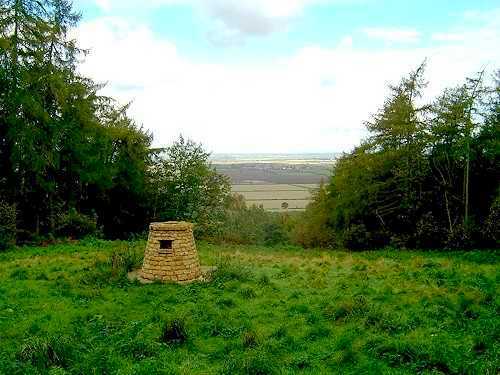 It had been a very enjoyable day and I am hopeful of visiting Waltham on The Wolds next October to repeat the experience, and I think Larry and Peter would be very happy to accompany me, and, who knows, maybe we will also have Mick and Ray with us.